Osmonics Duraslick membrane elements incorporate an iDuraslick• is a new family series of membrane elements engineered for use with foulingprone brackish water applications. Duraslick is designed to utilize an innovative threelayer membrane, of which a proprietary middle layer creates extreme smoothness, and provide a high rejection of sodium chloride. Independent studies have demonstrated that Duraslick RO 2540 elements are superior to standard polyamide spiral wound membrane elements for desalination of difficult feed water sources. Duraslick RO 2540 elements retrofit existing RO systems to obtain lower fouling, reduced overall energy usage, increased membrane service life and an extension of operating time between required cleanings, which in turn reduces expenditures on required chemicals. 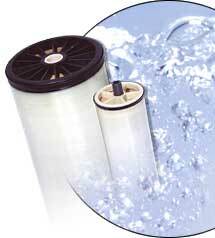 The Duraslick RO 2540 element construction features a fiberglass outer wrap. 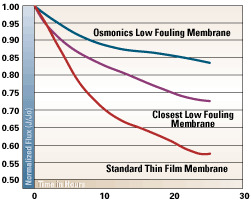 The Membrane Selection Dilemma Membrane surface smoothness is one of the main factors in preventing membrane fouling. When organic material comes into contact with a membrane surface, it inherently finds places to adhere, thus initiating membrane fouling. If the foulant has a biological origin, a potential site for a colony to grow is created wherever a spore attaches to the membrane. Traditionally, cellulose acetate (CA) membranes with relatively smooth surfaces have been used for surface water applications. While these membranes are typically less susceptible to fouling from organics, CA membranes have a shorter life span and need to operate at almost double the pressure to approach the same salt rejection properties of polyamide (PA) membranes. 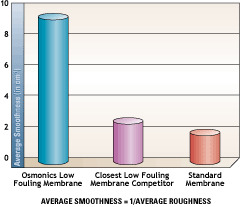 These drawbacks led GE Osmonics to develop an even smoother membrane solution. An Extra Membrane Layer Creates a Smoother Membrane Standard polyamide reverse osmosis (RO) and nanofiltration (NF) membranes consist of a polyester backing material followed by a polysulfone ultrafiltration support on which a thin film of polyamide is deposited. This design has an inherent roughness that can be seen on a microscopic level. The peaks and valleys observed on the membrane surface catch colloidal particles and/or contaminants from the feed water, causing fouling. The innovative addition of a proprietary intermediary layer, as well as membrane chemistry adjustment, has resulted in a membrane with a very smooth and fouling resistant surface. With this 3-layer membrane design incorporated in Duraslick elements, GE Osmonics has succeeded in developing a PA thin film membrane element that decreases the rate of microbial and particulate attachment, has superior membrane stability and chemical compatibility, reduces flux loss, and extends the time between required cleanings. A Smoother Membrane is Less Fouling The 3-layer membrane in Duraslick elements is considerably less prone to fouling when compared to other competitive low-fouling or standard thin film membranes for difficult waters. 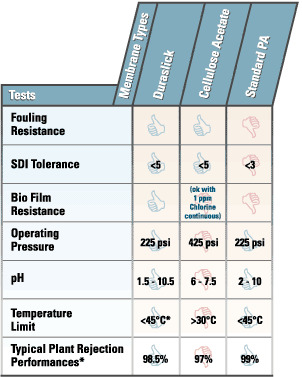 The Yale University study chart, shown here, established that smoothness was the most influential factor in membrane fouling resistance, regardless of operating conditions. The Flux/Time graph and the smoothness comparison table illustrate the correlation between loss of flux and membrane surface smoothness.